If you’re struggling to pay your family’s bills and there doesn’t seem to be a way to catch up, you may be thinking about declaring bankruptcy. Before you commit to that process, though, it makes sense to obtain credit counseling. We say this because, if you do decide to file for bankruptcy, you will almost certainly be required to undergo this counseling, anyhow. And, if you try counseling first, you may discover less drastic ways to solve your financial crunch than bankruptcy filing. Here is a list of credit counseling agencies, ones that are approved for use if you ultimately file for bankruptcy. Propublica.com (an independent, nonprofit, investigative newsroom) took an in-depth look at both bankruptcy options, providing useful statistics about each. We will be using its information in select places throughout this post. You may find this option to be more appealing because, if approved, you won’t have to repay many of your debts. You get assigned a trustee who distributes your assets according to the terms of the bankruptcy. To qualify, though, you may need to pass what’s called the means test. This test reviews the median monthly income for your state for a family of your size. If your income exceeds that amount, you may need to file for Chapter 13 bankruptcy instead, because failing this test indicates to the government that you may have enough income to repay some debts. The means test will be part of the qualifying process for Chapter 7 if more than half of your debt is consumer debt. such as credit cards and car payments, instead of tax debt, business-related debt, or tort debts, which are debts accrued because of damages or injuries you caused to another person. Here is an overview of the two types of bankruptcies to help you understand the differences. 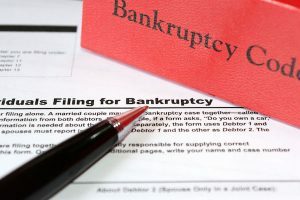 What is Chapter 7 Bankruptcy (Also Known as “Straight Bankruptcy”)? When you file for Chapter 7 bankruptcy, any assets you own above the legal threshold are divided among your creditors, with a trustee assigned to you doing the distributing. This makes this form of bankruptcy a type of liquidation. Having said that, 95 percent of people who file for Chapter 7 don’t have enough assets to exceed the threshold so they don’t need to give up any of them. On average, this process takes three-and-a-half months from the time you file until debts are discharged (meaning, you no longer owe the money) and will remain on your credit report for ten years. Not all debts can be discharged, although credit card balances and outstanding medical bills typically can be. Debts that typically aren’t discharged include student loans, child support, alimony, taxes, real estate liens, and certain assets classified as luxury. With house payments, car loans and the like, you can typically either give up the assets or continue to make payments. Every case is different, though, so it will be important to determine what applies specifically to you. Don’t go by what you know happened to someone else. Before this process is completed, you will attend a meeting of creditors. This gives your creditors the opportunity to dispute the discharge of debts owed to them. If they win a dispute at this meeting, you may still owe those creditors money. People typically use an attorney to file for a Chapter 7 bankruptcy. From 2008 through 2015, 92 percent of them did. Those who filed with an attorney during that time period were more successful in getting debts discharged (98 percent versus 72 percent). If you think of Chapter 7 as a form of liquidation, a Chapter 13 bankruptcy is a repayment plan. Debts are consolidated, and you make one single payment, with the amount based on your income. The goal of the bankruptcy court will be to find a repayment plan that is achievable for your situation. This typically involves repayment of a percentage of your outstanding unsecured debts, and you may also need to continue to separately pay certain other bills, such as your utility bills. On average, you’d pay back debts on a three- to five-year plan, with five years being typical. A key benefit of filing a Chapter 13 bankruptcy is that if you’ve fallen behind on mortgage payments, foreclosure proceedings would be stopped and you would have the opportunity to catch up payments without losing your home. Looking at filings between 2008 and 2010, about 41 percent of people who filed for Chapter 13 got their debts discharged that way. Another 10 percent initially filed for Chapter 13 but ultimately had their debts discharged through Chapter 7. With this type of filing, you almost always need an attorney, with Propublica.com saying it is “very rare” to be successful without one. To successfully navigate the psychological parts of the process, it’s important to mentally reframe this process as an opportunity for a financial fresh start. It’s also important to separate what you can change—such as over-reliance on credit cards to buy what you don’t necessarily need—from what you had no control over—such as accumulating large amounts of medical bills after a catastrophic illness. Then you can create a plan to successfully manage what is within your control, financially speaking, going forward. Tips found here, provided by Forbes.com about managing the psychological challenges of filing for a business bankruptcy, still apply. The reality is that when employees are stressed out about their financial situation, they aren’t at their best at work. They aren’t as focused. They aren’t as productive. They aren’t as engaged. They may not support their coworkers as well as they once did and, in fact, may be putting increasingly more work on them as their productivity declines. When people are under stress for extended periods of time, it can even affect their immune systems, making them for susceptible to illnesses. When this happens, they miss work more often. This can compound their financial challenges, while also impacting the company further because of their increased absenteeism. Before we get into how, specifically, our plans can help with bankruptcy proceedings, it’s important to note that we also offer a Legal and Financial Wellness Initiative. This initiative provides employees with a comprehensive program that includes, among other benefits, coaching to help them resolve financial challenges. Plus, our financial coaches will guide them through creating stable financial lifestyles that will benefit them today and in the future. Now, as noted by more than one source in our post, to help to ensure the success of the bankruptcy filing, it’s crucial to have experienced legal guidance. When employees have ready access to experienced attorneys who can guide them through the bankruptcy process, this also helps to alleviate their stress and gives them the opportunity to have a financial fresh start. Our Family Defender™ plan is a group legal plan that gives your employees access to qualified attorneys who can advise them on bankruptcy proceedings, including whether Chapter 7 or Chapter 13 makes the most sense for their unique situation. Our group legal services plan is a voluntary benefit, one that doesn’t cost you as the employer anything, but provides your employees with a valuable benefit that can help them meet deal with the most commonly needed legal issues. In addition to assistance with bankruptcy matters, this affordable plan also provides coverage for estate planning, family law matters, traffic violations, real estate transactions, criminal violations, and much more. U.S. Legal Services also offers the Identity Defender™, a special plan enhancement that helps plan members resolve identity theft and fraud issues, which further protects your employees’ financial stability. We invite you to contact us online today or call 1.800.356.LAWS to discuss how this voluntary benefit would work for your workplace. We make enrollment quick and easy, and our experienced customer service representatives can answer questions to make all a smooth experience. Contact us today to get started!